In case you're interested in knowing why there are so many product reviews being posted recently (near the end of March, 2019), here is the story. I used to be pretty consistent about emailing people to ask for reviews of products bought from my online store. Then, about a year ago, Google notified me about their new review system, where people can review my products and stars will show up next to my products in google searches. I began reading about how to do that but the thing that I could not get past was that the hundreds of reviews I already have cannot be transferred to google. And, if I wanted reviews to appear as they are now in my store in addition to google, people would have to review their purchases twice. That would be an unacceptable burden to place on them. So, I had to decide whether I wanted to use google reviews or to continue with the system that is currently in my store. I procrastinated with this decision. But, I've finally decided to keep the system in my store and forego google reviews. So, I've send out a few hundred requests for reviews today and they will all be entered in the system in the next few days. Even though they are for sales from the past year or so, the reviews are all dated recently. Hope that explains it. I've been having a very difficult time acquiring curly maple for our Pegs & Jokers and Marbles & Jokers games lately. So yesterday, I bought 200 board feet of rock maple and that is what I'll use for these games for the time being. The problem is that the quality of the curly maple is very poor, with many knots and much gray heartwood. The new Rock Maple is very white and bright. Our power has been restored but the internet is still down. Time-Warner needs to move the old trunk wires from the old downed pole to the new one. BUT, the good news is that I bought a T-Mobile data plan that gives internet access via a hotspot and I have been able to access my store and online shipping program to ship orders. I'm using it now to update this blog. As of tomorrow, I will be completely caught up, fulfilling all orders, and there should be no more delays. I'm sorry for those of you who ordered last week and the week before. The delays are over!! We had very high winds here in Rochester and I haven't had any electrical power here since early Wednesday. A pole was blown in two and the wires we pulled out of my house. So, sorry if you have ordered anything from me in the past few days, but I haven't been able to make anything. They were digging the hole for the new pole this morning but they don't know when pjower will be restored. UPDATE: As of Sunday night (March 12), electrical power and heat is restored. I still have very limited internet and especially phone. PLEASE USE EMAIL TO COMMUNICATE. Use the CONTACT page. I strongly prefer if you would use the contact form to contact me rather than a phone call. I do 99% of the work to run the business and spend most of my time making things. When I get a phone call while working at the shop, I have to stop working, shut down machines so that I can hear, remove my dust mask and hearing protection to talk to the caller. Also, I don't have internet access at the shop except on my cell phone and can't take an order or check the status of your order because I'm using the phone to talk to the caller. And,, it's hard to remember everything the caller asked. When there are multiple callers, remembering who wants what is practically impossible. With email, I can always find the details of a conversation. So please use the contact form on the site if you have questions. I check it often and reply by the next morning at the latest. As of today, playing cards are now included with our Peg and Jokers and Marbles and Jokers games. The price of the games remains the same! Carol Burnett and Family Play "Sorry"
This is a funny video of Carol Burnett's Family playing "Sorry", which happens to be very similar to our "Aggravation" board games. My shop will be open open to the public today from 6-9pm. Stop by if you're in the neighborhood. Mention this post for a 10% discount. Enter through Door #1 and walk down the stairs. Unique cutting boards and games. Working on a possible new product. 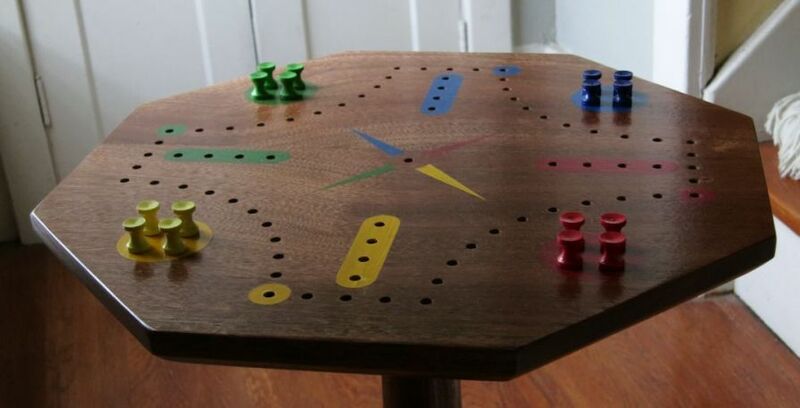 A 4-player Aggravation Game Table made of sapele (mahogany). With pegs.